Buried in the middle of our Jan. 11 Classifieds section was a small blurb about the Port of Brownsville and its commissioners holding a public hearing that night on limited tax general obligation bonds. After the Port of Bremerton formed a new taxing district to pay for the Bremerton Marina without taxpayer input, anytime the words “port”, “tax” and “bonds” appear in the same sentence our interest is piqued. I called Port Manager Jerry Rowland to get the details about the bonds, and what exactly the port commissioners hoped to do with them. The first thing to make clear is the port is not looking to increase its taxes, Rowland said. Let me repeat: The port commissioners are not going to raise taxes. The limited tax general obligation bonds, or LTGO for short, would provide the port the money it needs to upgrade its docks, Rowland said. Currently the port has the capability to take out $3 million in bonds to pay for the installation of new aluminum finger piers, but Rowland said commissioners are only looking to take out about $1.8 million. The port has already upgraded 16 of its finger piers from the aging wood slats to the all aluminum docks. Commissioners were set to vote on the bonds last week, but withheld a decision when they learned the port’s credit rating wouldn’t be renewed until a financial audit was conducted. The port currently has a AA credit rating by Standard & Poor’s, but because the port is set to be audited this year the ratings agency is waiting for the results of that audit to issue its rating, Rowland said. Rowland talked with someone at the State Auditors Office to see if the state could conduct a financial audit soon, with a more comprehensive audit coming sometime later this year. Once the audit is complete and the rating in place the commissioners appear on board to approve taking out the bonds. “They want to bond, they want to move forward with the project and rebuild,” Rowland said. Once commissioners give the project a final nod Rowland will submit request for proposals for bids to install the first section of docks. “We’re going to do this one small step at a time,” he said. Mahan represents portions of South Kitsap, Southwest Bremerton, Seabeck/Holly/Crosby. District 2 Commissioner Larry Stokes represents downtown Port Orchard and portions of Eastern South Kitsap. His term is up Dec. 31, 2013. Roger Zabinski, the newest port commissioner, represents District 1, including West Bremerton and portions of East Bremerton through Dec. 31, 2015. In other Mahan family news, it appears Sandy Mahan, wife of Monty Mahan, Bill’s son, has a serious illness. In a blog entry on “Monty’s view,” Monty Mahan said tests indicate his wife may have cancer in the bones around her spinal column. More testing is under way. Monty Mahan, who ran unsuccessfully for Kitsap County Commissioner in 2007, is executive director of the Pierce Conservation District in Pierce County. He and Sandy have 9 children, including some who are adopted and some with special needs. Wednesday, June 2: 8:30 a.m. The board’s weekly work study session will include a 30 minute presentation by Parks and Recreation Director Jim Dumwiddie about parks grants, County Fire Marshal David Lynam will follow with a 45 minute presentation about special events. The board will take a 10 minute break then reconvene for an hour presentation by DCD Director Larry Keeton about large onsite sewage systems. The board will then recess into executive session for 30 minutes to discuss existing litigation and then recess again into executive session from 11:30 to noon to discuss real estate matters. They’ll adjourn following the executive sessions. Wednesday, June 2: 5 p.m. The City Council will have a briefing until 5:30 p.m. where they’ll convene their regular session in council chambers. The following items are on the general business agenda: approve parking enforcement services contract with Diamond Parking; award contract to Stan Palmer Construction for construction of the Lions Park Renovation project. The public hearing portion of the meeting includes: review of a Local Solicitation 2010 Justice Assistance grant application; public hearing on an ordinance to amend Title 18 titled “City Fire Code” of the Bremerton Municipal Code and to adopt the 2009 changes to the International Fire Code; hearing an ordinance to amend Chapter 17.04 titled “State Building Code Adoption” of Bremerton Municipal Code, to repeal the adoption of the Washington State Ventilation and Indoor Air Quality Code and to adopt the 2009 editions of the various building codes. Council committee reports will follow and then adjournment. (A story on the Diamond Parking contract is here). Wednesday, June 3: 7 p.m. The council will begin the meeting with an update from Mayor Becky Erickson. There are only two items on the business agenda. They include: reviewing a contract amendment with ICF Jones & Stokes for a Dogfish Creek study; and a contract amendment with Krazan for the Fjord Slide Repair project. Tuesday, June 2: 1 p.m. I either didn’t receive the agenda for KCCHA before the long weekend or I accidentally deleted it. The agenda is not listed on the website (or if it is I can’t find it), but here’s what the organization submitted for the civic calendar listing for its meeting: The Kitsap County Consolidated Housing Authority commissioners will meet at the Norm Dicks Government Center, 345 Sixth St. This public meeting will include an executive session (closed to the public) to discuss real estate and potential litigation. That’s all I got for the short week. Hope everyone is enjoying their day off today. Could Bozeman Spell Change for SEED? Check out Rachel Pritchett’s Kitsap Business blog to see what Cary Bozeman had to say about Kitsap SEED, among other things. Granted, he works at the behest of the commissioners, but they had to know what he was thinking before they hired him. The Port of Bremerton is interested in buying waterfront property near its Bremerton Marina. The Kitsap County Consolidated Housing Authority once had plans on building more condos and hotel space next to its two Harborside Condomoniums building. It’s now taking offers, though. Rachel Pritchett has the story on what the port might want to do. Boaters would like parking. It’s the one thing boaters have always said was a weakness of the new site. Parking isn’t the only option, commissioners say. By the way, all three commissioners are interested. Larry Stokes, who regained his former commissioner spot in large part because of his disgust with how the marina was funded, nonetheless has said that now that the marina is here, he wants it to succeed. The port and the city of Bremerton had a celebration marking the annexation of SKIA into the city. I didn’t go. Rachel Pritchett was off, so she didn’t go either. Justine Frederiksen at the Port Orchard Independent went and filed this. Included was a comment from Larry Stokes, port commissioner. Do we want to start this conversation again? The Kitsap County Association of Realtors’ Board of Directors is planning to draft a letter asking the Port of Bremerton to at least temporarily cease spending money on the Kitsap Sustainable Energy and Economic Development project. Mike Eliason, association executive, said the statement will not so much be against the overall project as much as it is a statement about the economy and the number of vacancies in the county. Eliason said commercial vacancies are above 10 percent and industrial properties seeing vacancies even higher. Adding more industrial property, he said, could harm the overall market. Kitsap SEED is designed to be a business park for clean technology companies. The first phase is to include an incubator for start-up clean-tech businesses. We got an e-mail telling us that Air Force One landed at the Bremerton National Airport. We laughed, but I called the port to verify. A 737, light blue at that, carrying Navy personnel, did land at the airport. We’re guessing it’s for the Kitty Hawk event tomorrow. In the meantime, though, that doesn’t mean you can’t go out to the airport if the plane is still there and take grainy pictures that make it look like Air Force One. Use those pictures to launch a conspiracy theory. The St. Petersburg Times will measure Obama's promise keeping on its PolitiFact site. During the 2008 election the St. Petersburg Times employed a Truth-O-Meter to give a quick look at candidate statements and whether they were true. 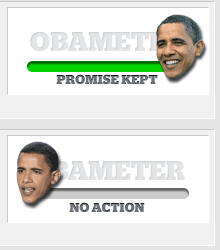 There’s a meter for all 510 promises made by Barack Obama in the campaign. Two have already been kept, three are in the works and 505 have seen no action. That’s understandable, since he’s not really president yet. PolitiFact is not expecting 100 percent compliance. Word is they’re going to make this into a widget. If so, I’ll see if we can get it added on our site. The Washington State Boundary Review Board decided Thursday night to allow Bremerton’s annexation of the smaller part of SKIA to stand as requested. Port Orchard’s mayor, Lary Coppola, said the news was good for his city, because it doesn’t preclude Port Orchard from being the sewer service provider in the future. In Bremerton, meanwhile, a planner for the city characterized the board’s decision as saying the board is not the place to determine how sewer will happen. I’ll have more later, and Port Orchard’s press release and the Bremerton e-mail follow the “more” button below. Ken Attebery, the Port of Bremerton’s chief executive officer announced today he is retiring. The port has been having discussions about who fills in his absence and personnel executive sessions. I can only assume that Attebery has been the point of discussion. Attebery said he initiated the decision. He’s eligible to retire and the budget work for 2009 is done. No, I haven’t heard more about tonight’s meeting. I have, however, spoken with Noah Israel of Godstream Technologies and Jonathan Hampton of Ceramic Cement Research Institute Inc. of Arkansas. Israel’s letter of intent is there as kind of a placeholder, holding room for the companies interested in coming to Kitsap County. One of those is Ceramic Cement Research Institute. Jonathan Hampton said he worked years in the construction field with cement, raised his 10 kids on it. His facility serves a couple functions. One is to do research on mineral-based cement that takes far less energy to make and can be stronger than traditional cement used. Traditional cement, which he referred to as “Portland Cement” needs dehydrating at temperatures up to 2,700 degrees to make, so cement is one of the big contributors to CO2 emissions. He also teaches contractors how to use the more eco-friendly cement, using his Arkansas lab to do it. He wants to come to Kitsap for a few reasons. One, he grew up in Alaska and doesn’t like living where he does. He spent about five years in Port Townsend. It’s not Alaska, he says, but it’s a nice compromise between that and where he is. Second, he would be coming because of the stated goal of Kitsap SEED, to help lead work into new greener technologies. The port has another letter of intent, which I’ve yet to see, but has been characterized three times for me, as an $8 million commitment from a private partner of a Las Vegas company that wants to build a new type of wall board in Kitsap County. Hampton described it as a replacement for sheetrock. It costs twice as much, but retains room temperatures for hours, where sheet rock will give way to outside temps in about 10 minutes. He estimates the new wall board saves 40 percent in energy over traditional boards. That company wants to locate at the port, and a New Zealand financier is putting up $8 million to tool the facility and make it ready to go. Godstream’s Noah Israel said the development project that the hearing examiner denied “with prejudice” has had that last phrase removed and her decision is being appealed before the county council. The argument he’s making is that the hearing examiner used the same pattern in denying his application that she did in doing so to another application, a decision the county council overturned. Specifically, she was applying engineering standards she would have no knowledge of and apparently no business using. Israel said in the past it was his company that converted the trees to finished product for the siding, flooring and moulding at Islandwood. His particular interest in SEED heightened when he had the setback with the community development he was proposing for Arlington went south along with the housing market. He’s been developing these relationships with like-minded companies in other products. Hampton said he and Israel met about a year ago at Washington State University, where Hampton was speaking on ceramic cement at a conference. WSU is Hampton’s preferred testing facility. I’ll blog live from the meeting. Just got a notice that port commissioners will meet at 7 p.m. Tuesday night to reconsider the contract they had signed with Godstream Tech. I’ll post more when I know more. Just talked to Port Commissioner Bill Mahan. He said he didn’t yet know why the meeting had been called. I’ve left a message with Cheryl Kincer, commission president. I don’t think I’ll have any more tonight. In the mid 1930s my dad’s older brothers had gone to a movie in downtown Denver and were walking around the area afterward. From the alley they heard a man swearing about FDR and Benjamin F. Stapleton, who had recently regained his mayor job after four years away. My uncles went into the alley to see who the man yelling was, and it turned out to be their own father. Blaine Elmer Gardner had worked for the city of Denver in an inspector role on the highways. He’d blow a whistle and the big trucks would have to stop. He took my dad, who was no older than 4, to work with him from time to time and let him blow the whistle. Dad got a kick out of having these adults obeying his command and later became a police officer, which probably wasn’t as fun. Well, that didn’t go well, did it. My laptop wouldn’t let me connect to the Internet, so I couldn’t live blog. Better there than at something really critical. The two meetings were very well attended, about 100 total when you don’t include port staff and reporters. Larry Stokes said he wants a vote on it. Most of those who commented on that favored it, though one audience member said it is the commissioners’ job to make that decision. From my perspective the crowd was a pretty even mix of those in favor and those opposed, as well as a few undecideds. There were some good questions from all three camps and a couple of arguments. Go to the link above. There’s a short video for a little flavor. I plan to attend both Kitsap SEED town hall meetings today and assuming the technology works and the crowd size seems to merit, I’ll live blog it. The crowd won’t have to be large at all, because even if it’s one or two there will be presentations made at both. He was referring to the Renewable Energy Finance Forum West that took place in the last week in October in Seattle. As RV mentioned in the previous post, the Puget Sound Business Journal will host the Green Business Summit on Nov. 12. The agenda looks to me to be about businesses implementing green strategies. My interest in the Bay Area clean-tech event was that it was about the money. While the port can lay the table and market the site, it will be private investors, most likely, that would make a site like Kitsap SEED successful or prove that it’s not a good fit for the area. And those private investors, whose primary interest still appears to be about return, are taking an enthusiastic look at clean technology. This actually has application in how we cover the port. When I was hired in Vancouver I was assigned as part of my beat the Port of Vancouver. I was a business reporter. Looking back, that’s a statement by the paper that it places higher deference to the port’s role in driving economic development than its role as a government body. Traditionally we have assigned Port of Bremerton coverage based on who had the city of Bremerton as a beat. That changed when my role changed, because Andy Binion was also covering cops in addition to his Bremerton coverage. In this job, I’m more a government guy. That isn’t to say we don’t recognize the port’s role in economic development. What we’re considering, however, is following the model Vancouver set in assigning a business reporter to the topic instead of a government reporter. Education reporters cover school boards. Environmental reporters can go to any of the local governments when the issue is land use. The port in the middle of government wrangling right now when it comes to SEED. But the economic development question is what provides the context behind whatever answer the elected port commissioners choose. Should the port continue to be my beat, that’s something I will work to make clear. Should it end up going to a business reporter, that’s a new angle to start from. This is why Kitsap SEED has never been an “If you build it, he will come” scenario. The Berk study indicates it’s more like like, “If you build it and champion it, they might come.” What business venture isn’t like that? On Wednesday the Port of Bremerton will hold a town hall meeting about the Kitsap Sustainable Energy and Economic Development project. The commissioners and staff will make presentations, providing some history and context and looks into the future. Next would come time for residents to speak and ask questions. Speaking of clean-tech, I heard about this next thing from a Facebook friend. (I’m not into networking, really, but if I can do it online without actually ever talking to someone, neato!) If you’ve got $1,500 to spend, a yammerin’ to go to San Francisco and a genuine interest in clean technology and where to invest your money in the industry, you may want to go to the Gerson Lehrman Group Clean Tech Summit. It’s a two-day forum on where the money will be in clean-technology. The information on the site indicates there will be 20 sessions focusing on investment into different clean technologies. An expected audience of more than 200 executives will represent clean technology ventures, active clean technology investors, government and near-governmental entities, and others. Regulatory obstacles and governmental support. Who will not attend, you ask? Believe me, this isn’t the time to be asking my bosses to send me to San Francisco in less than two weeks. They might have approved that, oh, eight years ago. What I really wonder is if anyone from the port is going. I’ve sent inquiries. It’s cheaper than another study. The town hall meetings will be at 3:30 p.m. and 7 p.m., Wednesday at the Comfort Inn at 5640 Kitsap Way in Bremerton. The next evening, 7 p.m., there is a budget hearing at the airport.